Vintage Base™ is formulated to be taken with meals to help in the absorption of nutrients in food as well as those in the product. 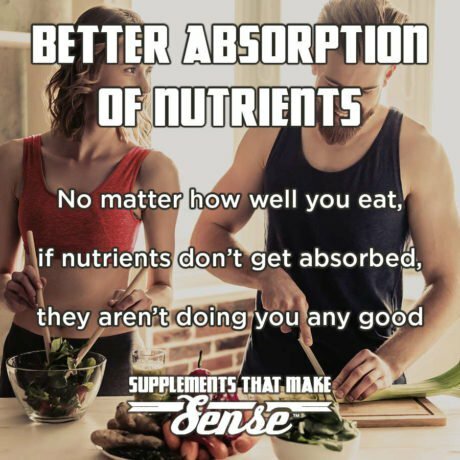 No matter how many vitamins and minerals you take, if they don’t get absorbed, they’re not doing you any good. Vintage Base™ is specifically formulated to maximize your absorption of vitamins and minerals, both from the product, and from the food you consume daily. 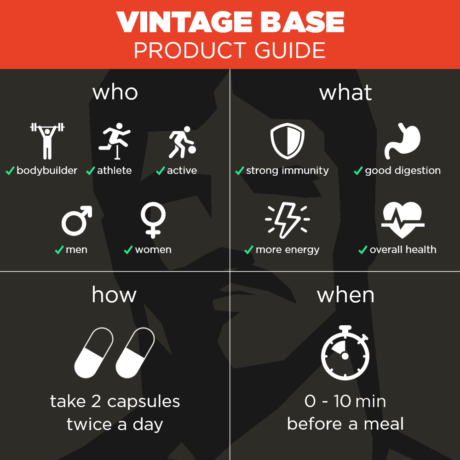 Vintage Base™ is designed for active men and women who work hard and want to be smart about supplements. 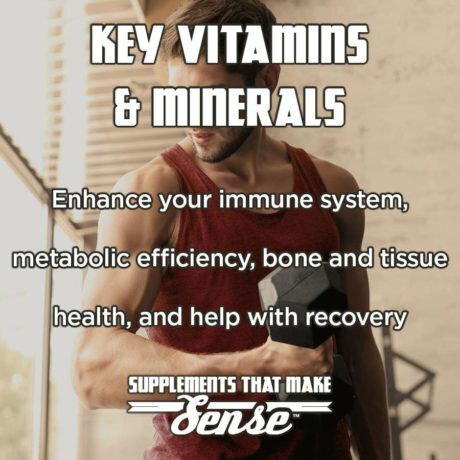 Its premium non-GMO vitamins and minerals enhance your immune system and metabolic efficiency, bone and tissue health, and recovery – to help with your health, training, and diet goals. Vintage Base™ delivers potent live probiotic strains in each capsule, which helps with key nutrient absorption, contributes to good digestive health, promotes the balance of intestinal flora, and supports a strong immune system. 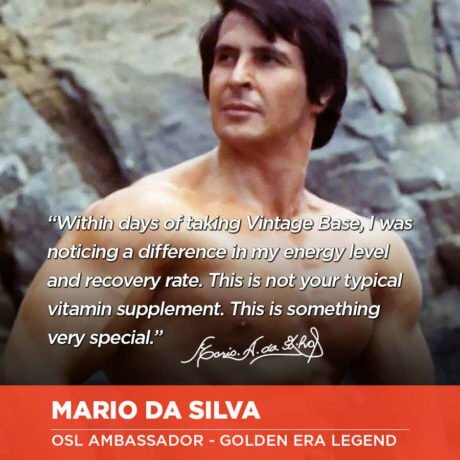 Vintage Base is part of our Health & Vitality supplements range. We created it because achieving a balanced, head-turning musculature should never come at the expense of your health. However, by taking those one-a-day under-dosed multivitamins, or the 'athletic' mega-dosed ones, your body cannot absorb a large part of the vitamins and minerals it is being given. And, will simply pass them in urine (sometimes turning it to bright yellow). Vintage Base combines key vitamins and minerals in an effective dose with potent probiotics. These 'good' bacteria help increase the absorption of nutrients in the product, as well as those in your food. At Old School Labs™, we set out from the start to be an uncompromising brand, delivering exclusively premium products. Because we sell directly to you, we are able to afford to include only the best quality ingredients in all of our products. 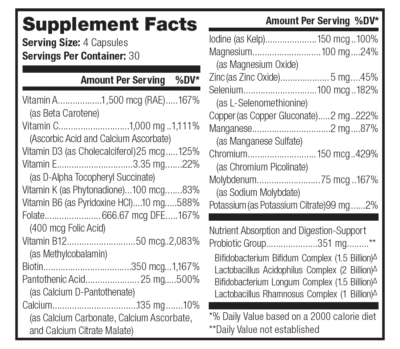 Press More to read about the ingredients you will find in Vintage Base™ in descending order of weight. Also known as beta-carotene or retinol, Vitamin A is essential for immune system function, and helps with the maintenance of normal vision and healthy night vision. Reduces oxidative stress and helps protect proteins from oxidative damage that commonly occurs during training. Vitamin D has gained in popularity lately, and for good reason. This vitamin is important in insulin and prolactin secretion, muscle function, as well as immune and stress response. In addition to detoxifying free radicals and preventing damage to cell membranes, Vitamin E enhances immune response and protects the liver. 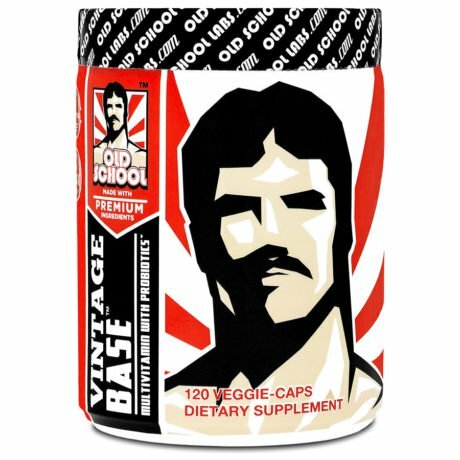 Helps build bone, especially in conjunction with vitamins A and D, also present in Vintage Base™. Also helps with blood coagulation. A vitamin typically found in fresh vegetables and linked to amino acid, glucose and lipid metabolism, as well as hemoglobin synthesis. Also known as folate, this vitamin breaks down and synthesizes amino acids, as well as synthesizing nucleic acids, which are essential in building new blood cells. A micronutrient used to convert protein and carbohydrates into energy, and essential for getting oxygen to tissues in order to help peak performance. This vitamin plays a key role in metabolizing fats, carbohydrates, and proteins. Part of the chemistry of coenzyme A, which is vital in the metabolism of carbohydrates, fats, and proteins – and is necessary for normal adrenal cortex function. A mineral involved in the production of energy and maintenance of healthy immune function. It is also essential in developing and maintaining healthy bones and teeth. Plays an integral part in the thyroid hormones, which have important metabolic roles related to energy production. Involved in multiple biochemical reactions of metabolic function, including energy production, cardiovascular regulation and exercise performance. An essential trace element that helps boost the immune system, as well as improve athletic performance and strength. This trace element is a constituent of multiple selenoproteins that play critical roles in reproduction, thyroid hormone metabolism, DNA synthesis, and protection from oxidative damage and infection. An essential trace element that helps stimulate the absorption of iron and plays a key role in respiration. It also helps maintain cell membranes, and is part of the enzyme that protects against cell damage. A mineral that plays an essential role in several enzyme systems involved in protein and energy metabolism. Essential trace element that aids in glucose metabolism and regulates blood sugar. Some studies also suggest that it helps protect against cardiovascular disease and high blood pressure. An essential mineral that is vital to the correct function of several enzymes and is obtained through diet or supplementation. A mineral and electrolyte that is essential for a steady heartbeat, the transmission of nervous system signals, and correct muscle function. A probiotic that helps stave off the ill effects of disease-causing microorganisms, particularly those that target your gastrointestinal tract. B. bifidum also helps to regulate or modulate the innate immune response. It has been proven to significantly help with the reduction of bowel issues such as constipation, diarrhea, gas, bloating, abdominal pain and cramping. L. acidophilus is a probiotic that produces lactase, the enzyme that breaks down the sugar in milk, and organic acids that inhibit the adherence and multiplication of pathogenic microbes. It reduces overgrowth of pathogens in your digestive tract, and increases immune response. In some cases, it has also been linked to the treatment of respiratory infections like sinusitis and bronchitis and to the prevention and treatment of diarrhea. A good bacteria that helps maintain a normal digestive tract, inhibits the growth of harmful bacteria, and boosts the immune system. This strain is frequently used in studies related to the antimutagenic and anticarcinogenic properties of probiotics. A facultative anaerobic lactic acid bacterium, this probiotic strain has been studied more than any other. It has a proven anti-inflammatory effect on the human GI tract, and is associated with a host of benefits ranging from boosting immunity to reducing anxiety. For use as a dietary supplement. Take 2 capsules twice a day before or with meals. For best results, use for at least 3 months to help establish optimal nutrient levels in the body. Is Vintage Base™ vegetarian friendly? Yes. There are no animal products, including gelatin, used in Vintage Base™. This includes the capsule, which is vegetable based. Should I take Vintage Base™ with food? We recommend taking Vintage Base™ before or with meals, since the probiotics in the product will increase your absorption of the vitamins and minerals in your food. 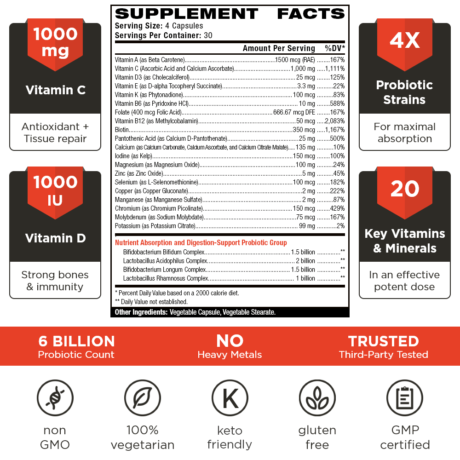 Why is Vintage Base™ better than regular multivitamins? In addition to being 100% pure, Vintage Base™ is designed not only to provide you with key vitamins, minerals, and probiotics – but aid in the absorption of nutrients in your foods. Can I take Vintage Base™ with another multivitamin? This is not recommended, since Vintage Base™ contains all of the vitamins and minerals you need, as well as helpful probiotics. Why doesn’t my urine change color when I take Vintage Base™? Because of its probiotic content, Vintage Base™ has a high absorbency rate, which means that more of the vitamins and minerals are used by your body – instead of being excreted and flushed down the toilet, as with many products. Does Vintage Base™ require refrigeration after opening to preserve probiotics? You don’t need to refrigerate Vintage Base™ after opening the bottle. The probiotics inside are shelf-stable, and though some probiotics require refrigeration, most – including Vintage Base™ – just need to stay in a cool and dry place.